You like Hockey, but your skating skills are not all there! 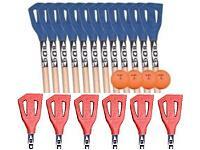 Here's the answer, Broomball! Broomball is played just like hockey except no skates. It's played wearing shoes on not so smooth ice. After your ice is carved up from skating, leave it as is, invite some friends over and enjoy a fantastic evening of Broomball right in your backyard. 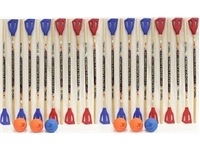 We've fashioned an affordable Broomball starter kit which includes: 12 Broomball Sticks (red and/or blue) along with an orange and blue D-Gel broomball. About $27.00 per person for YEARS of FUN! Made in Canada.